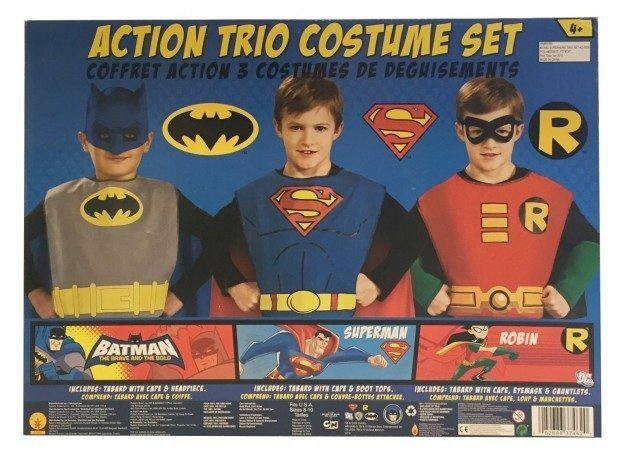 DC Comics Action Trio Child Costume Kit Just $15.60! Down From $33! You are here: Home / Great Deals / Amazon Deals / DC Comics Action Trio Child Costume Kit Just $15.60! Down From $33! Head over to Amazon to order DC Comics Action Trio Child Costume Kit Just $15.60! Down From $33! Shipping is FREE for Prime members or on orders of $35+. This costume kit includes a Batman tabard and headpiece, a Superman tabard and boot tops, and a Robin tabard, eyemask and gauntlets. This is an officially licensed DC Comics product!